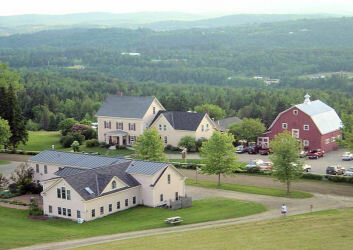 The Wildflower Inn is situated on over 500 acres atop a ridge overlooking the valley of Vermont s Northeast Kingdom; the near 360° views will take your breath away. You re sure to enjoy roaming over the inn s property, discovering the many amenities the Wildflower Inn has to offer the single traveler, family, or group. Amenities include children s activities (summer only); children s playroom; restaurant; gift shop; tennis and basketball courts; year round nature trails for biking, hiking, snowshoeing, x-country skiing; petting barn; sliding and skating; and more! Our little hidden treasure is our dining porch where the sunsets will amaze you - perfect for a romantic dinner. The bed and breakfast can also accommodate private parties, reunions, business meetings, small indoor weddings or a tent wedding. During your stay, be sure to take a ride up Burke Mountain or around the beautiful Northeast Kingdom! No mater what brings you here, your stay will be renewing. This and other Vermont Bed and Breakfast Inns can be found here in The Register.